Here we are again: I’ve reached that critical time of the year – as always in February – when it’s still all about cabbage and roots at the market, but my mind starts dreaming of juicy tomatoes and cucumbers, sweet berries and peaches, and seafood dinners at the sea – basically my summers in Malta. Luckily, February is quite a short month, then we have March, which at least offers ramps towards its end. In April I can feel the sun getting warmer, the sky becomes brighter, and the produce on my counter tops slowly starts to look more colourful. But for now, I must be patient and enjoy what I’ve got – a beautiful crisp head of cabbage. 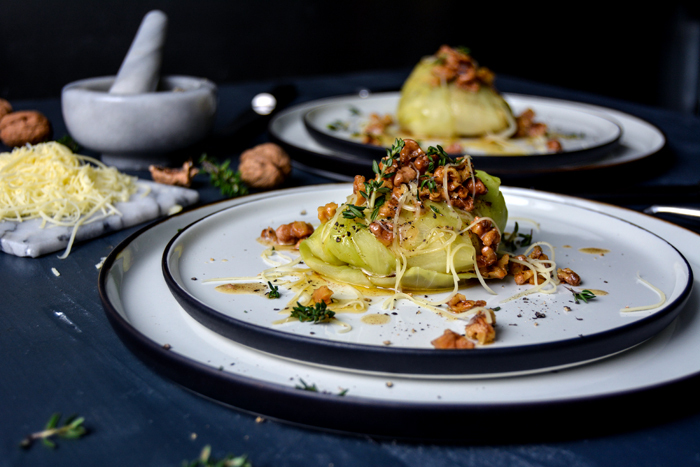 I blanched the large outer cabbage leaves and stuffed them with boiled potatoes, sour apple, fresh thyme, and a few spoonfuls of mascarpone, instead of sour cream, to bind the mixture. 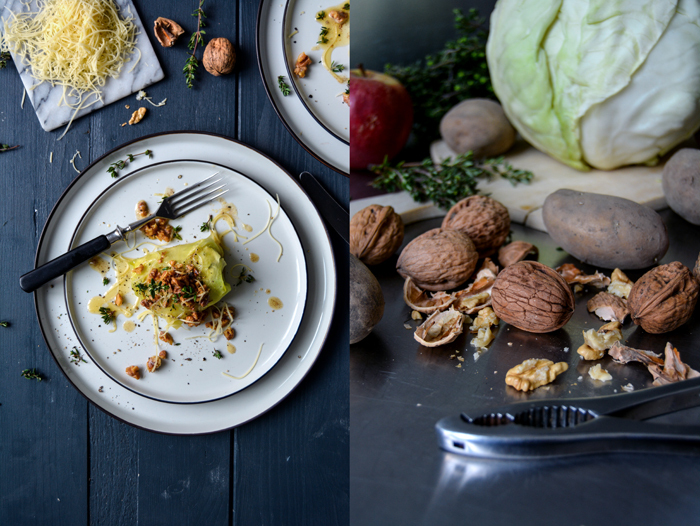 My personal highlight was the topping of crunchy walnut butter and freshly grated Gruyère. 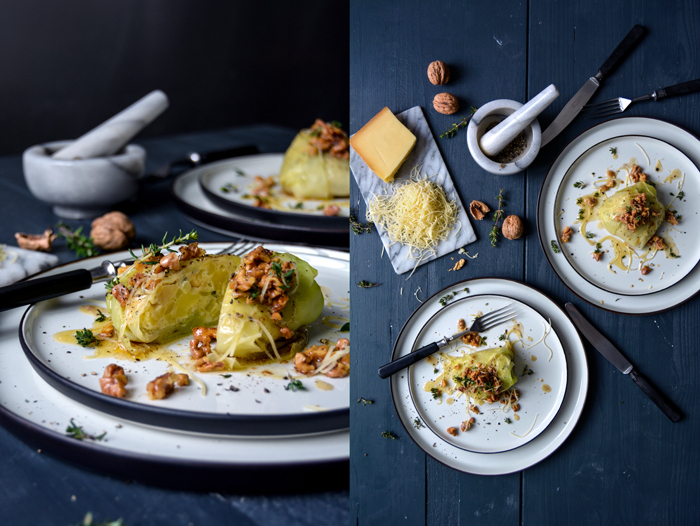 Any aromatic hard cheese would work here, but there’s something about this combination of the roasted nuts and this slightly sweet Swiss cheese that fits perfectly to these little wintery cabbage packages. For the cabbage leaves, take a large cabbage head and trim the bottom. Carefully peel off 8 large outer leaves. If they tear a little, it’s fine. You’ll only need 4-5 blanched leaves, blanch the remaining leaves to cover torn patches in the leaves that you use for the rolls. In a large pot, bring salted water to the boil and blanch the cabbage leaves for about 4-6 minutes or until tender. Rinse quickly under cold water, drain and cut out the hard stalk (in a slim triangle-shape). For the filling, in a large bowl, combine the boiled potatoes, apple, and thyme. Whisk together the mascarpone and egg and season with salt, pepper and nutmeg. Add to the potato-apple mixture, stir to combine, and season with salt and pepper to taste. Lay 4-5 cabbage leaves flat on the kitchen counter and cover torn parts with soft pieces of the remaining leaves. 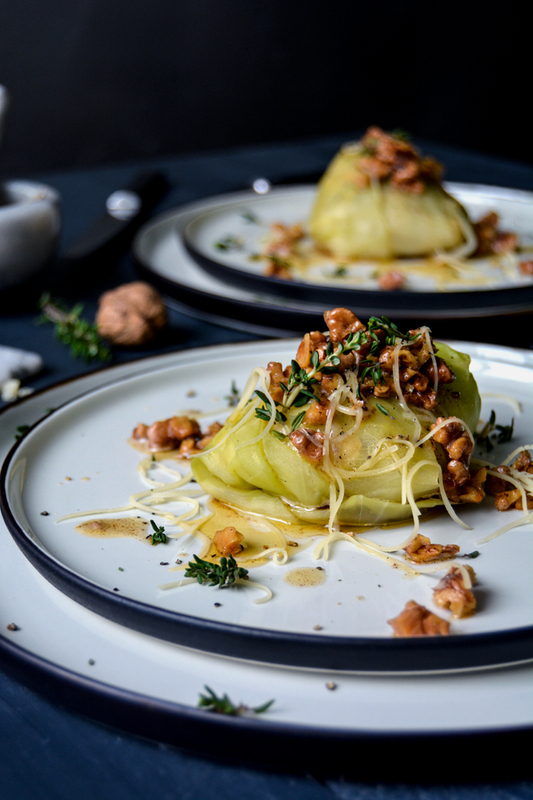 Put a generous tablespoon of the filling in the middle of each cabbage leaf, fold up the sides and roll it up, starting from the side of the stalk. Don’t worry if they don’t look perfect, mine didn’t either. They can all have their individual shape. Transfer the cabbage rolls to a baking dish and cover the bottom with a splash of white wine and some water. Bake in the oven for about 30-35 minutes or until golden and firm. 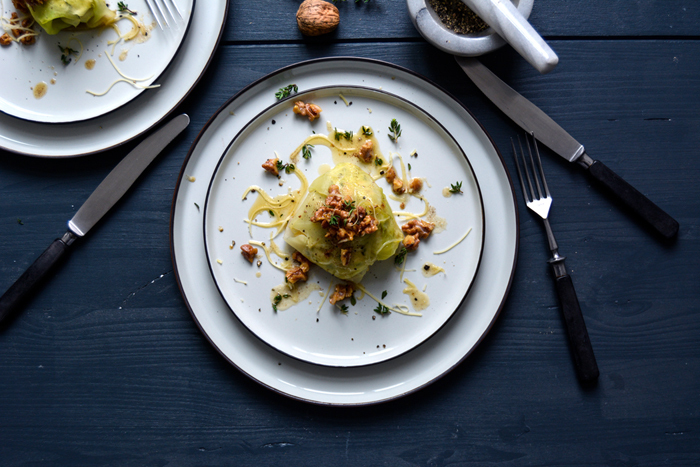 While the cabbage rolls are baking in the oven, prepare the walnut butter: In a small saucepan, melt the butter on high heat. When it’s sizzling hot, add the walnuts and turn the heat down to medium. Roast for 10-20 seconds or until golden but not dark. Take the saucepan off the heat. 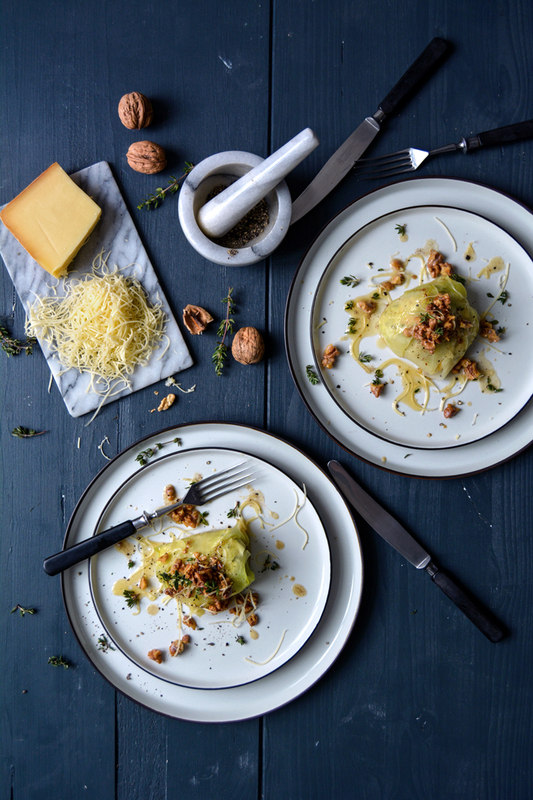 Divide the cabbage rolls between plates and drizzle with a little butter. Sprinkle with the roasted walnuts, fresh thyme, Gruyère, and crushed pepper. 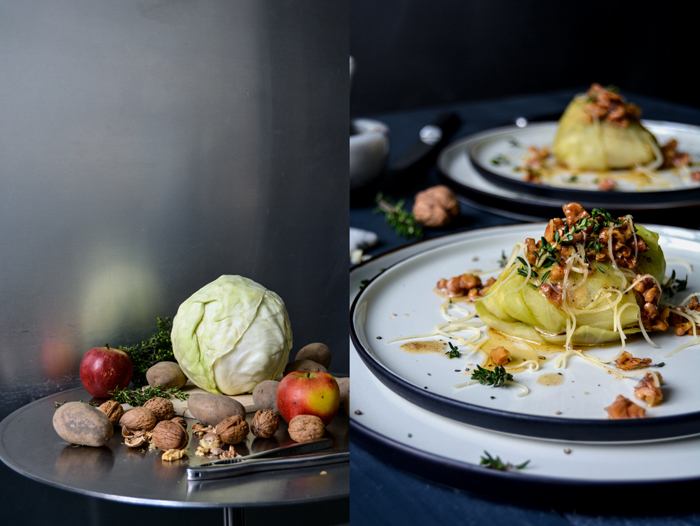 I love it–a new, simple but elegant version of stuffed cabbage! The flavor palate sounds luscious, and I agree that gruyere is the perfect cheese here. A must try for the upcoming very cold weekend here in Richmknd,VA! Thank you!